Can you confirm these amateur observations of Caaeteboia amarali? 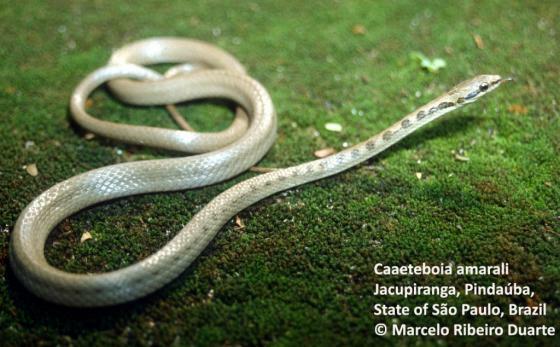 Diagnosis Diagnosis (Caaeteboia): Small (much less than 1 m), slender snakes with slender transverse (maxillary) processes of pre‐ maxillae bearing a small additional process oriented posteriorly from each transverse process (these are in addition to the vomerine processes); hemipenis typi‐ cally xenodontine, i.e., bilobed, semicapitate and sem‐ icalyculate; sulcus spermaticus divides on the proxi‐ mal region; branches of the sulcus on the lobes with centrolineal orientation; lobes small, the medial lobe shorter than the lateral one; capitula ornamented with small, ill‐defined papillate calyces, restricted to the sulcate and lateral surfaces of the lobes; hemipenial body ornamented with well‐defined lateral enlarged spines and smaller spines covering the asulcate and sulcate sides of the organ out of the intrasulcar region; body spines decreasing in length toward the base. Comment “incertae sedis” (of unclear status) according to DIXON 1989. 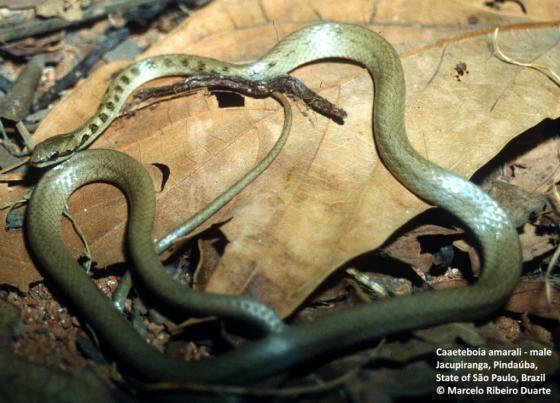 Type species: Liophis amarali Wettstein, 1930 is the type species of the genus Caaeteboia ZAHER et al. 2009. Etymology Named after Dr. Afranio do Amaral (1894-1982), physician, zoologist, herpetologist and Director of the Instituto Butantan (1919-1921 and 1928-1938).